Platini has said the payment he received from Blatter in 2011 was a "gentleman's agreement"
Fifa vice-president Michel Platini could be facing a life ban from football, according to his lawyer. The suspended Uefa chief is serving a 90-day suspension on corruption charges alongside outgoing Fifa president Sepp Blatter, while Fifa's adjudicatory committee considers its verdict. 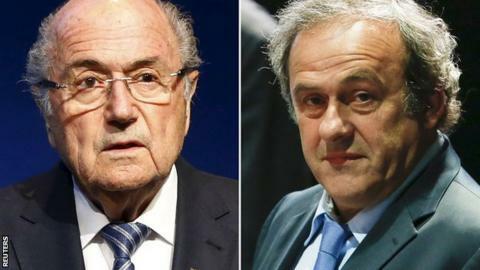 Platini's lawyer Thibaud d'Ales said the ethics investigators' "excessive" recommendations are a "scandal". The adjudicatory committee intends to announce its verdict next month. The Frenchman is facing sanctions over a "disloyal payment" that saw Platini, 60, receive £1.35m from Blatter, 79, in 2011 for consultation work done nine years earlier. The pair, who are serving 90-day provisional bans, have denied any wrongdoing, but admitted there was no written contract. The adjudicatory committee, led by German judge Hans Joachim Eckert, opened proceedings on Monday, after receiving the ethics committee's recommendations. Platini is currently barred from taking part in the campaign to replace Blatter as Fifa president in February, but is taking his case to the Court of Arbitration for Sport (Cas). Swiss Blatter, who has had recent health problems and claimed on Monday that he had been "close to dying", is also likely to appeal to Cas.